Bathroom En-suite, TV/DSTV, radio, intercom, safe, fridge, extra long double king sized beds, hairdryer, make up mirror, coffee/tea facilities, Nespresso machine, personalized bathroom amenities and a comfortable furnished relaxing area in which you experience the colonial atmosphere of our Bed and Breakfast. Most of the exclusive guest suites and stylish rooms have a spacious private veranda with spectacular views over the Knysna lagoon and the Knysna Heads into the Indian Ocean. 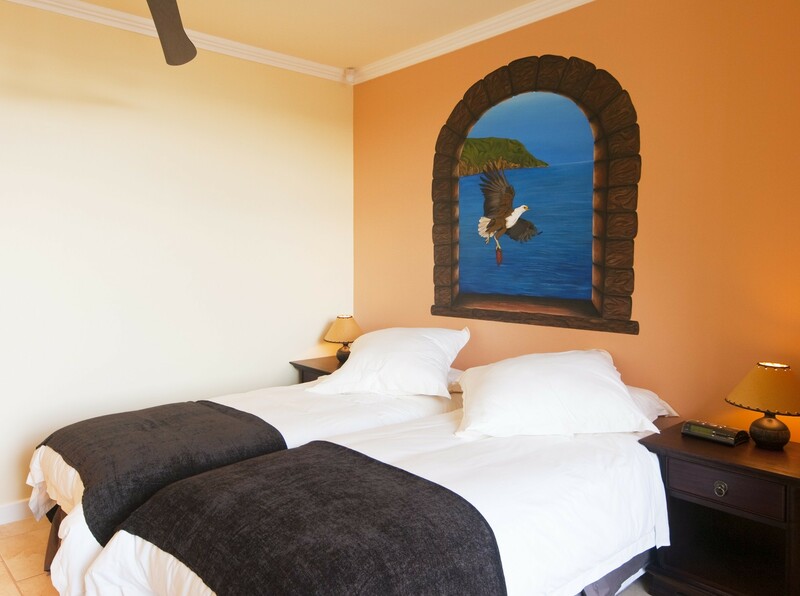 Guests have the use of our comfortable guest lounge decorated in colonial style, with a fireplace. Our guests can also relax at our swimming pool with sundeck and lounge chairs and a special terrace in our extended, cultivated garden. Relax at our pool with sundeck and lounge chairs and a special sitting area. Our guest have access to fast, stable and free wifi for the duration of their stay. Our Guest House is close to the waterfront and a mere 5 minutes walk from the centre of Knysna’s central business district, where you will find various local restaurants, shopping malls, African arts and crafts. 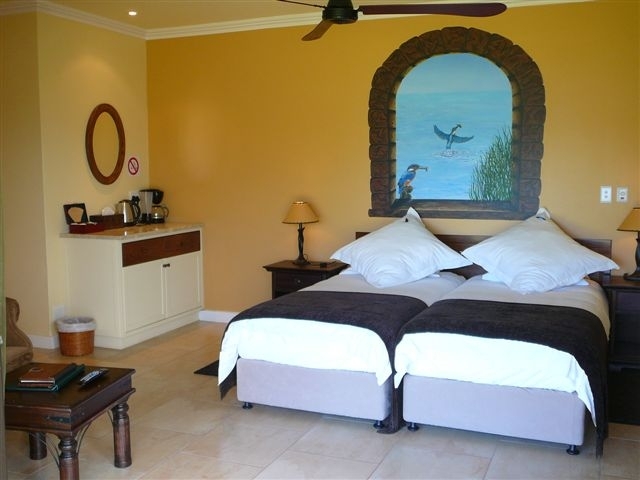 The suite has a comfortable furnished relaxing area and a private veranda with excellent views over the lagoon and the Knysna Heads into the Indian Ocean. En-Suite Bathroom with bath(skylight) and separate shower, personalized bathroom amenities, TV/DSTV, Radio, Safe, Fridge, extra long Double King Size bed, Hairdryer, Make up mirror, Coffee/Tea Facilities, Nespresso coffee machine. 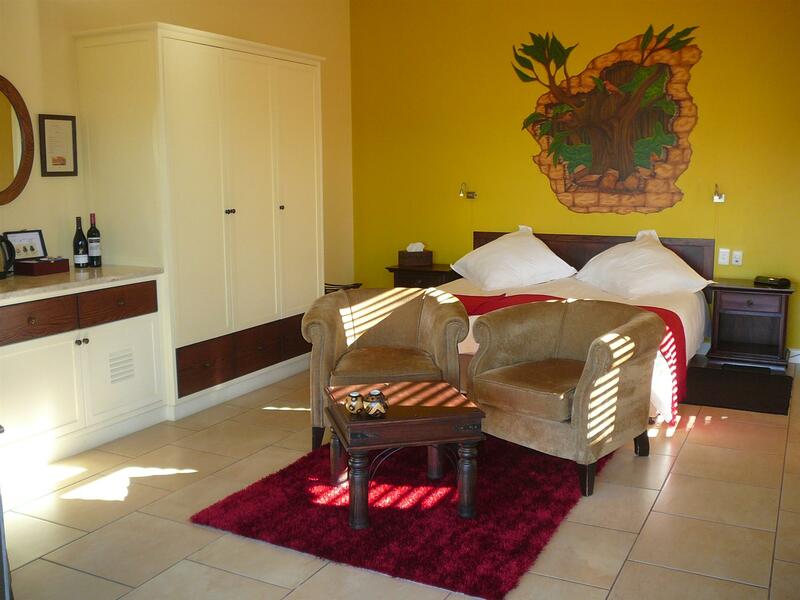 En-Suite Bathroom (separate bath & shower), personalized bathroom amenities,TV/DSTV, Radio, Intercom, Safe, Fridge, extra long Double King Size bed, Hairdryer, Make up mirror, Coffee/Tea Facilities, Nespresso coffee machine. 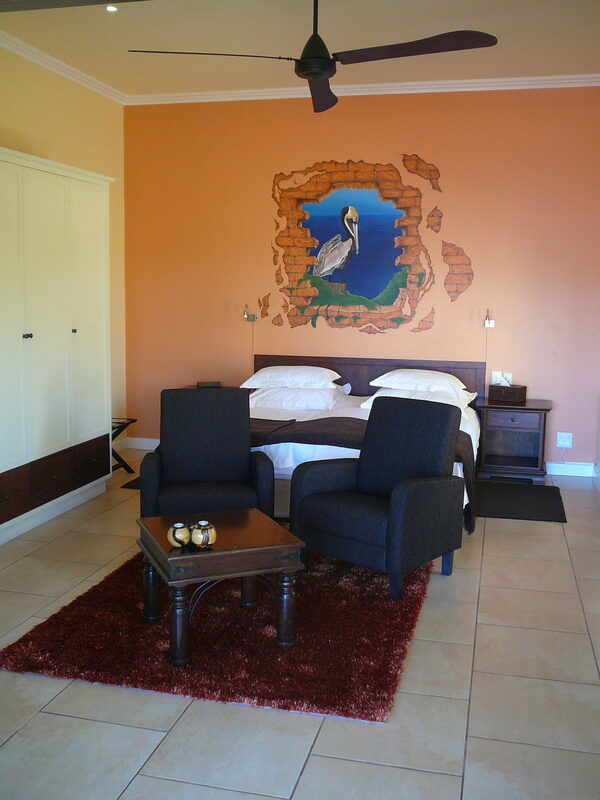 En-Suite Bathroom and personalized bathroom amenities, TV/DSTV, Radio, Safe, Fridge, extra long Double King Size bed,Hairdryer, Make up mirror, Coffee/Tea Facilities, Nespresso coffee machine. On offer is this wonderful Guest House opportunity in Knysna with a main house, 2 cottages and a separate, spacious owners private house all on the same premises (3650 m2) which is unique in this area. There is secure off-road parking for all guests and private vehicles. 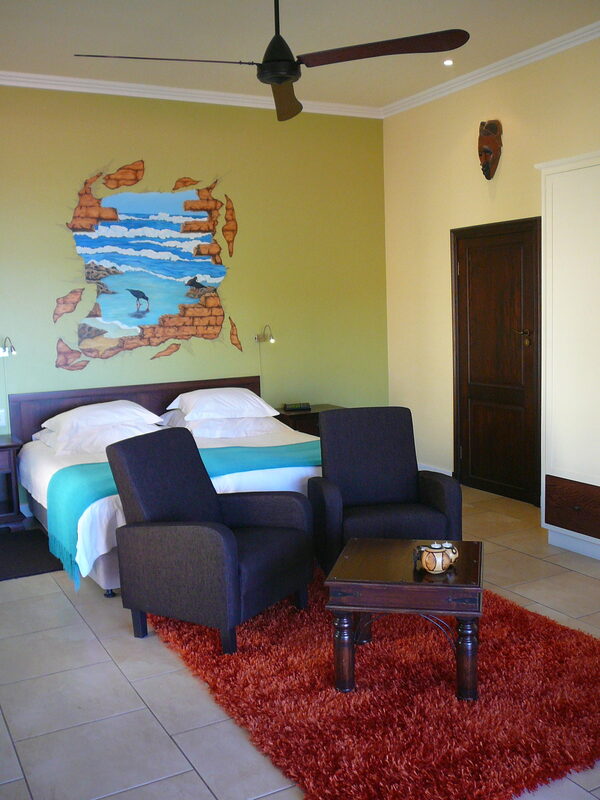 The Guest House has 8 spacious units all en suite with extra long King Size beds, Nespresso coffee machines and tea facilities, fridge, safe, DSTV/TV, hairdryer, radio, small lounge area and a fan. 6 out of the 8 units have private patios with excellent views of Knysna, the Lagoon and the Heads. All the suites have a bath and a separate shower. The main house has a solar system and in the spacious garden there are water reserve tanks to provide for the swimming pool and the garden as well. A communal lounge/breakfast area with fireplace and a fully equipped kitchen overlooks a sparkling pool with Balau decking and a comfortable sitting area with Boma. The private, separate owners house with solar heating consists of a reception office, 3 bedrooms, 3 bathrooms, open planning living spaces, storage and large fully equipped kitchen opening onto a balcony overlooking the lagoon at the front of the house. A separate scullery leads into the kitchen. At the back of the house, off the kitchen/living, is a courtyard/terrace suitable for entertaining and barbeques. There is a large storage space leading off this courtyard with open space for drying laundry. This commercial venture comes fully furnished with the exception of a few items listed and all the items in the private house. It is well advertised and has established a great reputation for excellent service, especially with overseas guests. It also offers a pleasant stop over for business travellers. Close to town makes it convenient to walk to the popular Waterfront and all the Restaurants. The financials will be made available to any serious buyer. 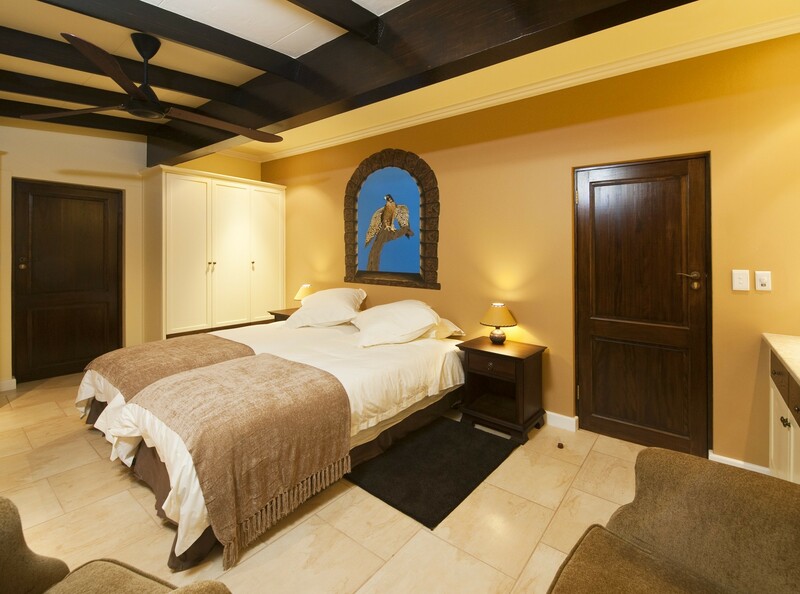 Total bedrooms: 8 (All en-suite and 6 with private balcony or veranda). Living/dining (breakfast area) room: 1 with fire place and seating area. Secured parking for 8 vehicles. Security: alarm system with camera and 24 hours response. Rates & Taxes: R 3200 pm. Booking.com: rated 9.8 out of 10. Tripadvisor Traveler’s Choice winner 2014, 2016, 2017 and 2018. 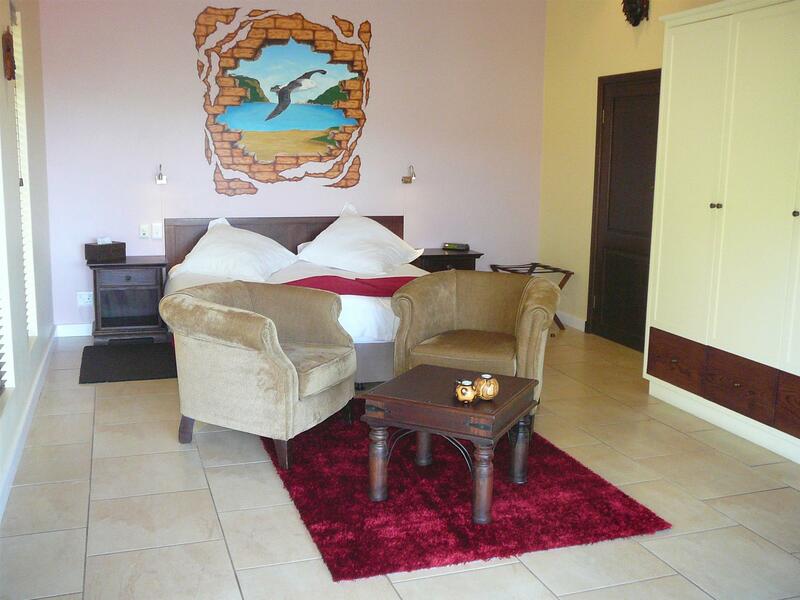 Total bedrooms: 3 (2 en-suite with private veranda or balcony). Kitchen: 1 with cooking isle. Living/dining: 1 with fire place. Sun panels on the roof. Balcony with view over Lagoon. Private back yard for barbeque and open yard.